DALLAS (AP) — Solar energy is booming in the United States, but companies riding the wave fear that President Donald Trump could undercut them this week if he decides to impose new tariffs on imported solar panels. Businesses that install solar-power systems are benefiting from a glut of cheaper panels made overseas, mostly in Asia. That has made solar power more competitive with electricity generated from coal and natural gas. A green-technology research firm estimates that tariffs could cost up to 88,000 U.S. jobs related to installing solar-power systems. On the other side are two U.S. subsidiaries of foreign companies that argue the domestic manufacturing of solar cells and modules has been decimated by a flood of imports, mostly from Chinese companies with operations throughout Asia. Imports of silicon photovoltaic cells, the building blocks of solar panels, soared nearly 500 percent between 2012 and 2016, according to the U.S. International Trade Commission. The four members of the commission — two Republicans and two Democrats — unanimously ruled in October that import are hurting American manufacturers, although they differed on exactly how the U.S. should respond. Trump has until Friday to act on the agency’s recommendations for tariffs of up to 35 percent. Trump has wide leeway — he can reject the recommendations, accept them, or go beyond them and impose tougher tariffs. Congress has no authority to review or veto his action. Countries harmed by his decision could appeal to the World Trade Organization. The trade case grew out of a complaint by Suniva Inc., a Georgia-based subsidiary of a Chinese company, which declared bankruptcy last April. Suniva was joined by SolarWorld Americas, the U.S. subsidiary of a German company. Suniva wants higher tariffs than those recommended by the trade commission. The U.S. Commerce Department imposed stiff anti-dumping duties on imported panels made from Chinese solar cells in 2012 and 2015. 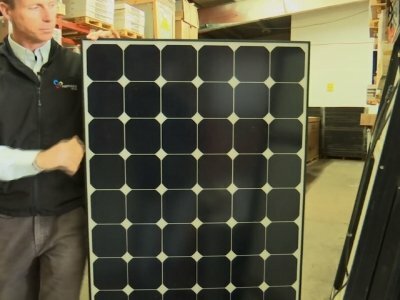 Tim Brightbill, SolarWorld Americas’ lawyer, said Chinese companies have gotten around those sanctions by assembling panels from cells produced in other Asian countries such as Malaysia and Vietnam. That makes the current trade case even more important, he said. A consultant for SolarWorld said tariffs on imports could create up to 45,000 U.S. jobs, assuming that domestic capacity grows, and installation jobs would also increase. But U.S. manufacturing of solar cells employed only about 1,300 people at its recent peak in 2012, according to the trade commission. While U.S. solar-cell manufacturing has shriveled, installations — from home rooftops to utility-scale operations — have boomed. Installations have soared more than tenfold since 2010, with the biggest jump coming in 2016, after prices for solar panels collapsed. In 2016, solar was the largest source of new U.S. electricity-generating capacity. The Solar Energy Industries Association, a trade group for U.S. installers, says tariffs would drive up the cost of installing solar-power systems, leading to a drop in demand. “We are selling energy that can be created by wind, by natural gas, by hydro, by coal, by nukes. When you raise the price of what we are selling, we can’t compete,” said Abigail Ross Hopper, the group’s president. Jim Petersen, CEO of PetersenDean, a California company that installs solar rooftop panels mostly for residential customers, once favored tariffs on imported panels, which he found to be of inferior quality. He has changed his mind. Petersen said tariffs could stunt his business by raising the cost of a job, which ranges from $6,000 to $60,000 or more. He said he might be forced to lay off up to 25 percent of his 3,200 installers. “This is bad for American jobs, bad for the consumer,” he said. In the New Mexico desert, Albuquerque-based Affordable Solar is working on a $45 million solar farm to help power a massive new data center for Facebook. The company’s president, Kevin Bassalleck, said tariffs would hurt homegrown companies that make racks, tracking systems and electronics that are part of a power system. He said jobs at those companies are hard to outsource. U.S. Sen. Martin Heinrich, a New Mexico Democrat and advocate for renewable energy, said tariffs won’t revive U.S. solar manufacturing. Many people on both sides of the debate expect Trump to impose sanctions. Brightbill, the lawyer for SolarWorld Americas, sounded confident.